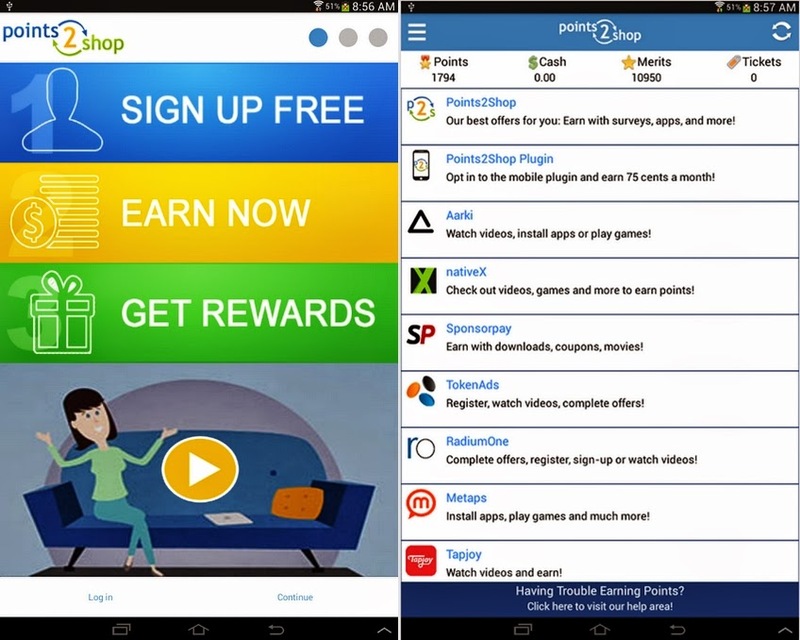 Points 2 shop is one of the largest online reward program with 6 million users at current. You can earn points by filling out surveys, completing offers, watching videos, by playing games or complete other tasks, and redeem those points for any free reward. 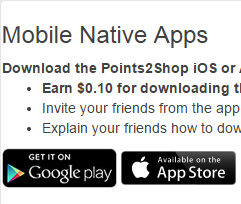 Points 2 shop mobile app is currently available for Android and iPhone users. You can earn cash rewards and gifts by just touching your smart phone. 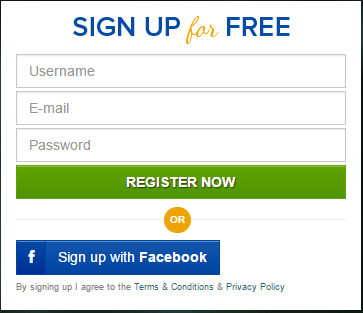 You can sign up in two ways, either by e-mail or through Facebook. Points 2 shop rewards you with 250 points for signing up. 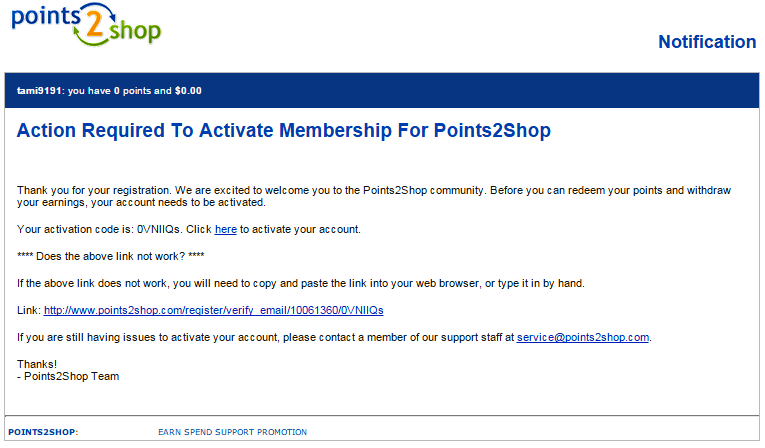 Click here to join points 2 shop. Choose user name and password of your desire and enter your valid e-mail ID. 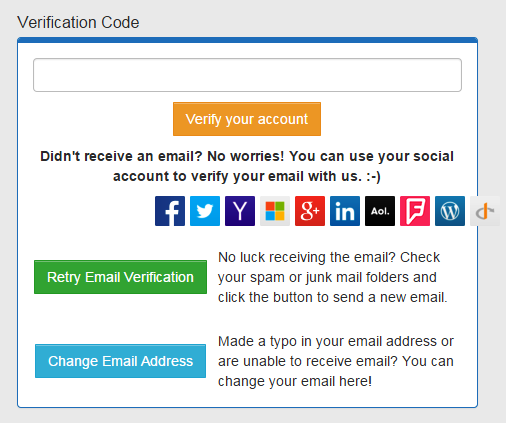 Once you click register you will get e-mail to your inbox as shown below. To activate your account you should either click the verification link or enter the activation code in the given box as shown below. If you sign up with your Facebook account. Your registration process will complete with just one click. After completing registration process you will be asked to complete your profile. Enter correct address as you will receive your payments through check. By completing profile you can get survey relevant to your field. Once you log in to your account, click visit page & complete the opportunity to see the best possible way to earn money in your country. Offers and tasks will vary according to your country you reside. Now the best offers available for you will be displayed as shown below. They are displayed in categories in order to ease your work. 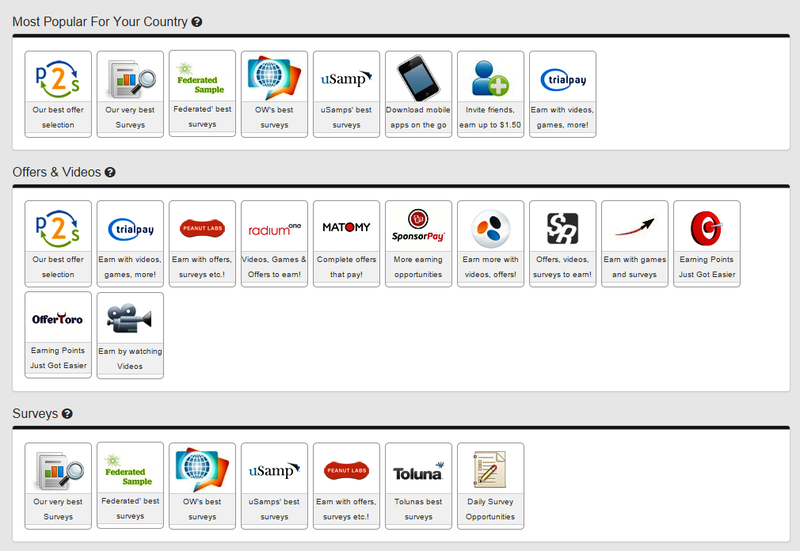 From all the categories few offers are selected and displayed as most popular in your country. Try to concentrate on those. You will get offers as shown above. Each tasks are displayed in a separate and you can see the points awarded for each offer along with it. Click the offer and complete it to earn points. It will be best if you work in your mobile phone. Because completing offers will be pretty easier. For example if a offer wants you to download an app from your mobile phone, it will be much easier if you directly work in a mobile phone, you cannot complete these offers from PC/laptop. Complete the offer by installing the app, earn points and you can delete those apps in one or two days. Similarly you will get other task like visiting websites, you can earn points by visiting other websites. The another best way to earn cash and points is by participating in surveys. You can earn more points by participating in survey than completing offers. You can also earn points by watching videos, playing games etc. After gathering enough points you can redeem it to cash or e-gift cards. Various payment methods are given below. P2S mobile app is available for Android users in play store and iPhone users in app store. You will be rewarded with 10 cents for downloading the app. The best way to keep in touch daily with points 2 shop is by downloading the mobile app. Using your phone you can complete your offers and mini tasks within few minutes. This is the best way to earn points. Mobile app download link will be available on P2P dashboard. Points 2 shop rewards cash for referring people to their site. You can earn up to $1.50 for referring each member. Points 2 cash provides easy way to refer your friends as shown below. There are three different methods to refer people. a) Through e-mail. Click the g-mail or yahoo to import all your contacts and enter the message you want to say and click invite button. Now the mail will be sent to all your friends and clients in your contact list. If they sign up through your e-mail link you will be rewarded. b). 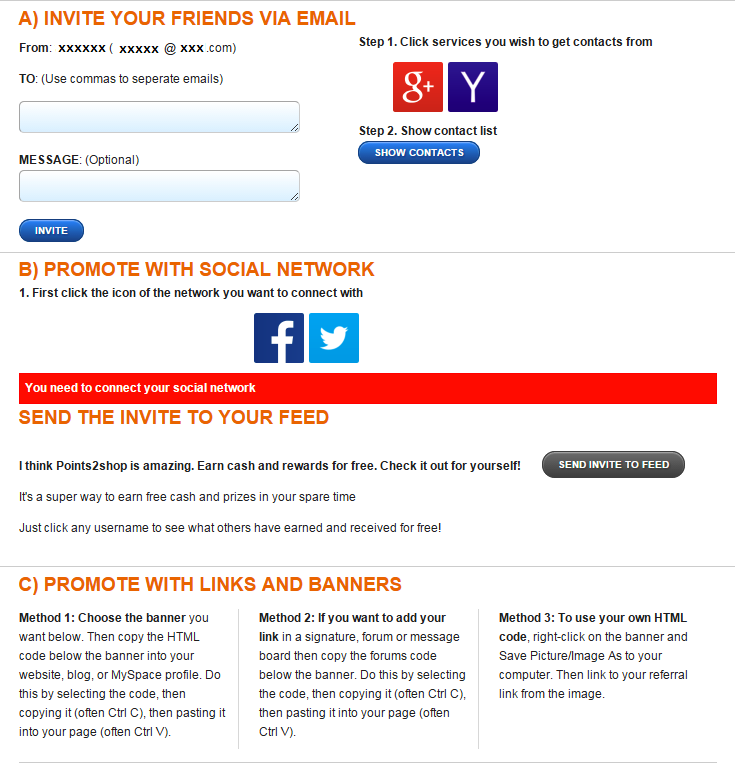 The second method is by sharing about points 2 cash in social networks. Click Facebook icon or twitter icon to share. If some one registers through your link you will be rewarded. c). You can refer people by promoting with links and banners through blogs. Points 2 shop provides four (facility) methods to withdraw your earnings. Paypal – You can withdraw your earnings through Paypal payment processor. The minimum payout is $1. Global virtual Visa® reward – You can withdraw your earnings through your visa card. Minimum payout is $5. 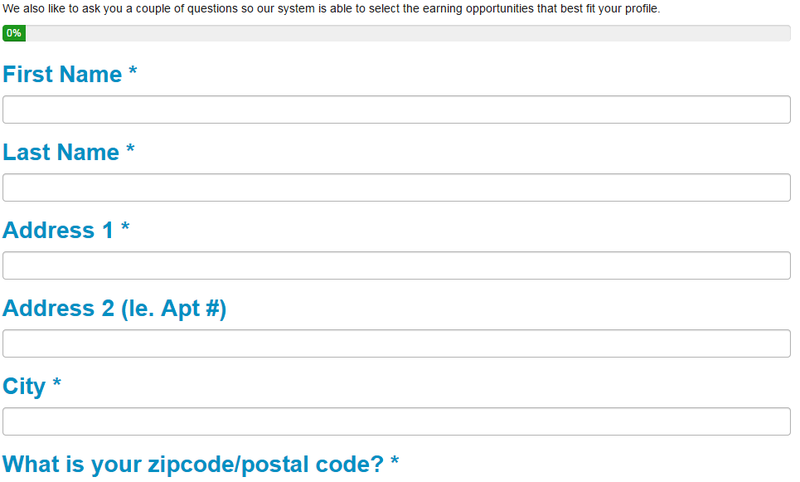 Check – You can receive your earnings through check. It will be delivered to your primary address. Minimum cash out is $5. Amazon.com gift card – You can redeem your points to get amazon gift card. You can use this when you shop online. If you withdraw your money through Paypal or visa you will be charged (withdrawal fee). For check withdrawal there is no withdrawal fees.